Would you like to learn how to handle hazardous materials safely and protect our environment from the waste that is generated? There are several learning opportunities and the newest is an online refresher training for hazardous waste management and laboratory safety. 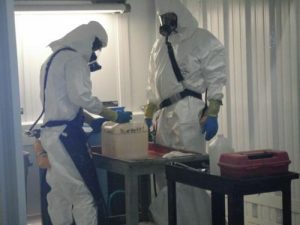 These classes provide information on the safe handling and disposal of hazardous chemicals and materials to meet federal and state regulations and avoid expensive violations. To learn about how to safely handle hazardous materials, you need to complete the Hazard Communication course. If you will be working in a laboratory, the Laboratory Standard instructor led class or an online version of the training must be completed. The hazardous waste management course will guide you in the simple steps to ensure NMSU compliance with the myriad of regulations related to hazardous, bio-hazardous, radioactive and other regulated waste, and the emergency response procedures for spills and safe clean up. For information on NMSU safety training requirements, visit http://safety.nmsu.edu/training/safety-training-requirements/.